An ultra runner prepares for new quest and reviews vests, shoes, socks and more along the way. I’ve learned a lot since my first run, a 1.6-mile jog around my block, where I stopped three times, puked in my driveway and thought I was going to die. Since then, there have been a succession of goals, leading to the Ultra Race of Champions (UROC) 100K in Virginia. and then my first 50-miler (check!). Those accomplishments and lessons learned have all created the path to the 100K race distance, essentially back-to-back marathons along a point-to-point course with 9,000 feet of elevation gain and about 8,000 feet of elevation loss. For comparison sake, the race with my highest previous elevation change was the Leadville Marathon — 6,200 feet total. UROC will be my most significant challenge to date. I figure that I will need between 12.5 and 14 hours to finish the race. 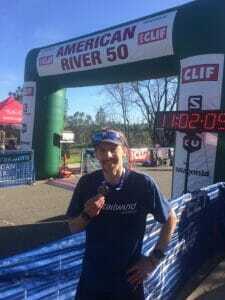 I finished my previous longest run in time and distance — the American River 50-miler — in 10:13:12. In addition to the physical training and mental preparedness, this race poses many different challenges, more so than any of my previous races. I will need to properly test and prep various gear, nutritional products and have a solid game plan for what running shoes to use. This is the first of a seven-part series on runningshoesguru.com where I will be reviewing various gear, offering tips and taking you along on my journey to 100 kilometers. Thanks for reading and let me know what questions you have about any of the gear, preparation and whatever else. Perhaps the biggest difference between the 100K distance and my previous 18 marathons and four ultras is the vest. Since I will be out on the trails longer, I will need to bring more gear and nutrition with me, including an extra layer for warmth or to protect against rain (if conditions warrant). During my previous ultras and the Leadville Marathon, I wore an Orange Mud backpack to carry extra hydration and a few essentials. In addition to the water bottles, there is enough room in the pack to carry my phone, a little nutrition and some basic first-aid supplies. Later in this series, I will be reviewing the three vests that I am considering using during my 50-miler (which will be my last long run before the main event) and the 100K. I am not a fan of reservoirs so I chose vests that provide bottles or flasks instead. The Ultimate Direction Scott Jurek FKT Vest, which has been enhanced since the 2.0 version. It comes with two bottles and an optional reservoir (which I passed on). The Nathan Fireball Race Vest, a lightweight and minimalist vest. It also comes with bottles and there is no bladder. There is an additional front phone pocket, which secures phones sized around an Apple iPhone 6. The Salomon S-Lab Sense Ultra 5 Set, which was recently named a Trail Runner Magazine’s Editor’s Choice winner. fast and light. No bladder on this one either, but two soft flasks provide hydration. 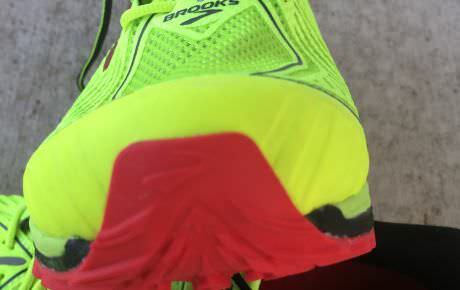 I have tested and reviewed quite a few trail shoes for Runningshoesguru.com. Both the 100K and 50-miler I will be doing this spring will have various challenges. Of course the weather could play a factor in the challenges but there will be no clear indication of what type of weather to prepare for — or to pack for as I head to each of the races. My plan is to bring two different types of shoes and then make the best educated guess on race morning on which pair will handle the course more effectively. 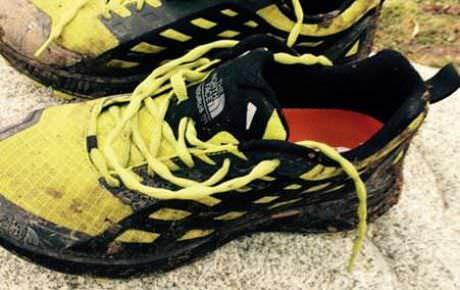 For the 100K, I may also decide to leave one pair of shoes in a drop bag that I can access midway through the race. I’ll need to do more research on the course itself before heading in that direction. It’s a sleek, fast and comfortable trail shoe that is quickly becoming my go-to choice for quality trail runs. In my review, I noted that it is very similar to the Mazamas and among my favorites for racing trails. 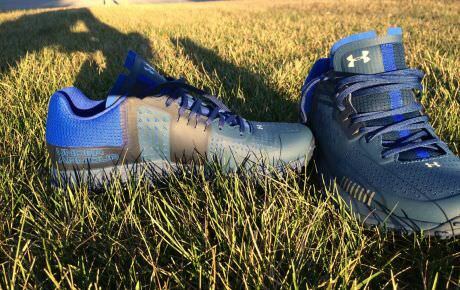 This shoe prides itself on being durable and handling trail obstacles with ease. The rugged trail shoe lives up to that promise with solid protective layering inside and outside, including a reinforced toe bumper and plate that are smoothly integrated within the design. 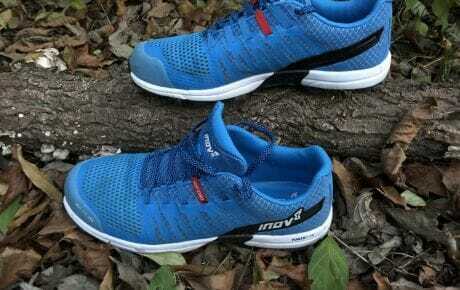 This is a new model intended to deliver maximum cushioning for trail runners. Beyond the comfortable fit, the Endurus provides solid traction through dirt, mud, snow and even ice. In most of my long-distance races, I have worn Injinji socks. They are well-known for being “toe socks,” which allow the toes to splay out. The theory suggests that with the toes not rubbing against each other, runners will be less likely to experience blisters. Injinjis have worked well for me in the past. My races have brought me through heat and water crossings — the ingredients for blisters — and I have not have sustained any issues. Still, I am open to trying new things and new brands of socks. So over the course of my training cycle, I will try other options, including Balega, Smartwool, Darn Tough and Drymax). Soon after I started running, I bought the bottom-of-the-line Garmin watch for keeping track of mileage, time and pace. It functioned well but as I progressed as a runner, I wanted more data and bought myself the Garmin 235, which offers heart rate, cadence and a host of other data. I am not a data geek as many runners profess to be. Yet I still find that it is important to have accurate and informative metrics on which to gauge myself and my performance, whether I am logging long miles in preparation for an ultra or doing Yasso 800 time trials to prepare for a road marathon where time is the priority. I know that the current battery life of my 235 won’t last the 10+ hours I expect to be on the trail. For my 50-miler, I decided to wear both my watches and use one and then the other to get an idea of my overall time, pace, etc. It worked out fine but as I look to the future and see more distances of the 50-miler and longer variety, there is logic in obtaining a new watch that has the stamina that matches my own. Stay tuned for a review in this series of a watch I pick out and how it fares in testing — especially battery life — and on race day. When I started on my running journey, I was among those who subscribed to the theory of carbo-loading the night before a race. And race-day fuel would be a combination of gels and water. I have refocused my pre-race meals on what I generally eat during the week. Nothing out of the ordinary and certainly not a carb-filled meal. I have most often been having a piece of grilled chicken with a sweet potato. On race morning, I generally have a bagel with peanut butter and a serving of Generation Ucan. While that combination does give me a carb boost, it focuses on foods easier to digest than a plate (or more) of pasta. This is what has worked for me when running half marathons, fulls and ultras. The 100K, however, will present more of a challenge as I will be relying on aid station food to keep me energized and able to make it to the next aid station. The majority of the aid stations are around five to seven miles apart. However, after departing the second and third aid stations runners won’t find another one for 11.4 miles. In the past, I have relied on bananas, peanut butter and jelly squares, peanut M&Ms and other typical aid station fare. I have experimented with different items to carry but have settled on my own stash of peanut M&MS (germ-free from other runners) and gluten-free Honey Stinger waffles. They are easily digestible and have helped give me a boost when needed. Still, given the duration of this race, I will experiment with other real foods. For beverages, I rely on water and have used Tailwind Nutrition in the past. But I am starting to rethink whether I want to continue using Tailwind — there are lot of ingredients in the mix, and I am trying to be more careful with what I am putting in to my body. UROC, like other recent races I have done, offers Gatorade so I will probably continue to practice with that to see how my body adjusts. Stay tuned. I’ll update you on the aforementioned topics in this seven-part series as I review the gear and work on my nutrition, leading up to UROC on May 12. Thanks for coming along with me on this journey.